Our mental models drive how we shape the world in ways that might lead to a sustainable future, or processes that might contribute to collapse. These often subliminal models are deeply held, ubiquitous, and constantly reinforced through unexamined culture and linguistic patterns. In this collection of eight essays, along with a chapter contribution from Derek Rasmussen, Chet Bowers builds on his exploration of the role of culture in creating and perpetuating the ecological crisis of our time and what may be done through cultural means to change our course towards a more sustainable future. This book builds on Bowers’ volume of earlier work regarding how education and communication propagate the industrial paradigm. Bowers assumes a sympathetic audience that understands environmental overshoot and the mounting urgency of societal transformation. Bowers specifically develops arguments around consumer identity and the commoditization of cultural commons as the root of our contemporary conceptual crisis. He argues for the redevelopment of a plural cultural commons to replace consumerism and the cultivation of ecological intelligence in place of destructive linguistic patterns. While this premise may sound simple, or even trite, Bowers provides a detailed and critical rationale for why we must avoid widespread ecological collapse and how we might actually go about making the transition to sustainability, particularly as teachers in formal classroom settings. Bowers argues for an awareness and reworking of language that has hindered our understanding of our place within ecological limits: language allows the past to colonize the present through “root metaphors” that remain widely unquestioned in the use of particular terms and phrases. 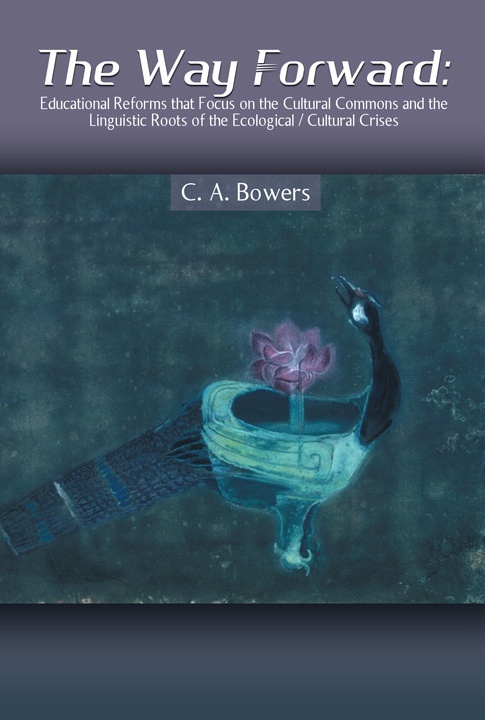 Bowers also critiques the notion that language is a neutral carrier of meaning and substantiates his argument in the core essay of the book entitled “Toward an Ecologically Sustainable Vocabulary.” He traces the historical use of the words, intelligence, technology, science and scientism, tradition, freedom, community, literacy, cultural and environmental commons, enclosure, globalization, liberalism, conservatism, subsistence, wealth, poverty, progress, development, and sustainability. Bowers provides illustrations of the implications of the past use of these terms, and suggests thick alternatives. He further describes how new metaphors can be developed in association with each word at different stages of learning as young people grow to adulthood. Inverting the “root metaphors” of patriarchy, anthropocentrism, individualism, progress, and others is a sustained task requiring constant self-reflection in the classroom, attention to learning moments, and opportunities for students to challenge each other. Additionally, the reconsideration of words like “tradition” and “conservative” offer an intriguing way to build common ground in a polarized political discourse around important values that serve a sustainable society. Whereas educators can and must play an important role in fostering a new paradigm of sustainability, academia can be accused of perpetuating the outdated paradigm. Bowers focuses in detail on the difficulty of creating new thinking out of an old paradigm, and the need for good and evolving metaphors so that we are not trapped into reducing new mental models through the use of old linguistic patterns. An important integrating theme in this collection of essays is the need to respect, learn from, and protect diverse cultures and ways of knowing and the fundamental interconnection between ecological and cultural diversity. This idea includes a challenge to the superiority of the written word as a primary determinant of intelligence. Derek compares “pattern languages” (for example, music, art, architecture) to “conceptual languages” (for example literacy and numeracy). Rasmussen reinforces Bowers in his development of the importance of “languaged understanding” which Rasmussen defines as “shared, collective, relational understanding – as opposed to innate or supposedly freestanding, objective understanding (Kindle Location 981).” We have privileged literacy and numeracy in such a way that while we have an explosion of a certain type of information, globally we have a massive erosion of overall knowledge. Rasmussen drily comments, “Rather than experiencing a wide scale “information explosion,” we are actually experiencing an information bulge in one narrow part of the spectrum of understanding––the part devoted to paper (or electronic) knowledge– –while all our other avenues of color and meaning have atrophied. (Kindle Locations 1144-1146).” Rasmussen points out that our reliance on the written word constrains us in situations where silence or presence might be better forms of communication and expression. Certainly this problem is ubiquitous in academia. Rasmussen suggests that we can reclaim our pattern languages in the process of shifting from an identity as consumers to one of membership in a community. I would highly recommend this collection of essays. They provide a nuanced development of the value of biocultural diversity from the starting point and problematic nature of Western culture. Though the writing is at times dense, Bowers provides an important contribution to our understanding of the workings of some key mental models that must be shed if we as a species are to find our way to a sustainable existence. Rasmussen’s contribution is a gem, applying a systems lens to modes of communication beyond literacy and numeracy, and making it clear why the continued loss of music and arts in our public education is a dangerous trend. I hope that Bowers in the future might expand on these essays by turning his considerable talents to unpacking the notion of democracy, the nature/culture dualism, and the concept of indigeneity, thereby extending his work deeper into the realm of ecological literacy.